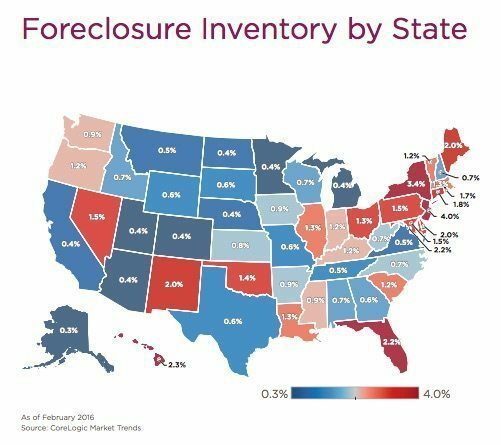 CoreLogic released its February 2016 National Foreclosure Report today, which showed that completed foreclosures continue to be on the steady decline. Two statistics are back to their November 2007 levels: the seriously delinquent rate and overall foreclosure rate. Five states -- Florida, California, Texas, Michigan and Ohio -- were responsible for nearly half of the past 12 months' completed foreclosures. CoreLogic released its February 2016 National Foreclosure Report today, which showed that completed foreclosures continue to be on the steady decline — lowering by 10 percent year-over-year and 2.6 percent month-over-month. The completed foreclosure rate is down 10% year-over-year. Specifically, in February there were 34,000 total foreclosures nationally, down from 38,000 at the same time last year. Still, these numbers have yet to reach the lows experienced by the pre-crisis market from 2000 to 2006, when the number of completed foreclosures per month was, on average, 21,000 nationwide. Two key stats are the lowest they’ve been since 2007: The seriously delinquent rate (a number that represents those single-family homeowners who are 90-days or more past due on their mortgage payment), which came in at 3.2 percent in February 2016, and the overall foreclosure rate (which accounts for homes in any stage of the foreclosure process) which decreased by 23.9 percent year-over-year from 571,000 to 434,000. The seriously delinquent & foreclosure rate are the lowest they’ve been since 2007. “Job creation averaged 207,000 during the first two months of 2016, and incomes grew over the past year,” said CoreLogic’s chief economist Frank Nothaft, in the report. Foreclosure inventory only accounts for 1.1 percent of all homes with a mortgage. That means that the national foreclosure inventory only accounts for 1.1 percent of all homes with a mortgage, in comparison to the 1.5 percent recorded in February 2015. 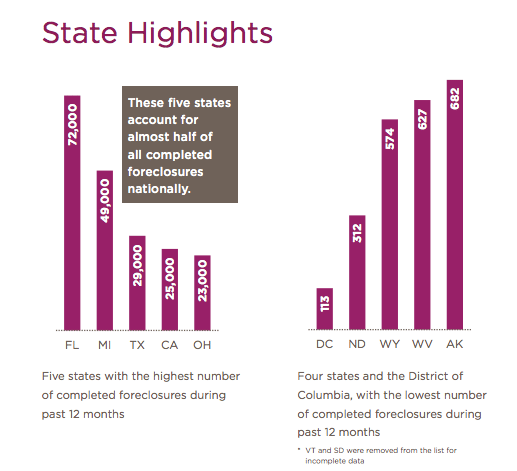 CoreLogic’s February 2016 National Foreclosure Report, State Highlights. In contrast, Washington, D.C., Wyoming, West Virginia and Arkansas had the lowest number of completed foreclosures over the last year.